A cost assessment before making any registration decision? Advice on REACH Registration 2018? To find a Letter of Access (LoA)? Assistance in taking the role of Lead Registrant? A member dossier in IUCLID format? As experts in European Chemical Regulations, we can help you register successfully. As SIEF manager, we handle the registration dossier from A to Z, organize cost sharing and take care of the SIEF continuity until 2018. Together, let’s identify the substances in your portfolio that need registering. Let’s make the best choices for your business according to the tonnage band but also according to your distribution strategy, so that you remain competitive. REACH 2018 is just around the corner! Let’s start your compliance journey today! Do you have an orphan substance? EcoMundo created the Lead Across Platform for the various substance families that end up being on their own, i.e. they are not covered by any consortium. This platform helps companies draft their REACH registration dossiers for lead compounds not included in any other consortium. The REACH Regulation 1907/2006 has defined an exhaustive list of REACH exemptions. If you are exempted from REACH, you need to check if no other regulation can be applied to your activities. Are you located outside the EU? We can assist you with your REACH compliance. Even as a non-EU manufacturer, you may need to comply with the REACH Regulation 1907/2006. Planning the best strategy for your company and helping you increase your business in Europe and potentially enter new markets is what we do. Don't wait until the last minute, start your compliance process today and reassure your European Clients. As an OR, we take on all your legal responsibilities and obligations. If you have other importers of the substance, they become downstream users according to the REACH Regulation. 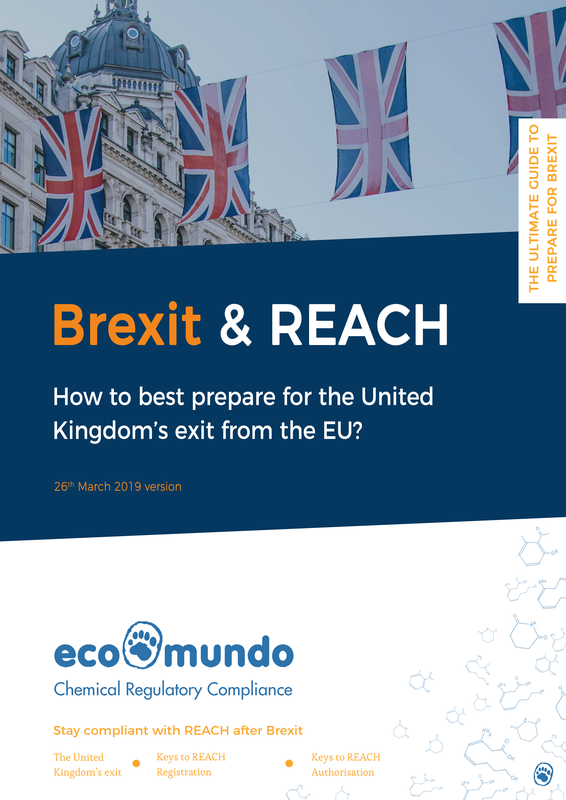 the impacts of Brexit on REACH. All you need to know about REACH Registration! Challenges: Our clients have a portfolio of hundreds of substances that need to be registered with ECHA. Within the portfolio, there is a great diversity of substances (SCC intermediate substance, full substance, UVB, ELINCS and so on) that has to be taken into account in order to adapt the best registration strategy to each of them. EcoMundo was chosen to carry out a Registration for the management of the portfolio and successfully implemented an optimal organization for the Registration of all the substances before the deadline of May 2018. Solutions: EcoMundo developed a unique methodology to manage the lead time for the portfolio registration. We developed several follow-up tools and reporting processes in order to give our clients a better knowledge of every step of the registration process. The collection of the SIEF data (LoA or available tests) gave the client the opportunity to anticipate the budget that he needs for the registration. Results: Since 2010, EcoMundo has successfully submitted hundreds of registration dossiers to ECHA. Challenges: As the company owns a great range of substances that need to be registered before 2018, the forecast of a budget for the registration is fundamental in order to sustain Synthron’s activity. EcoMundo was asked to carry out some budget estimations on the testing process (read-across, available data through the user license of another SIEF, etc) in order to give Synthron some financial insights on the costs as Lead Registrant. Solutions: For the Synthron account, EcoMundo identified similar substances and confirmed that the read-across strategy is a relevant approach. Thanks to its REACH registration experience, EcoMundo found alternatives so that Synthron won’t have to run toxicological test for all of its substances. Through this well-run methodology, we could present a coherent budget estimation for the substances of its client. Results: EcoMundo adapted the budget estimation for every substance in the portfolio (LoA for a member dossier, test costs for a full dossier). This method gave Synthron a very clear idea of the financial aspect of the registration and gave them the best tools to make its decisions for the registration of its substances. Challenges: EDF asked EcoMundo to update the Inquiry files they have submitted to ECHA. EDF was seeking the services of a company that could offer an expertise in the choices of their analytical tests. Solutions: Given EcoMundo’s experience in the analytical characterization of complex substances, our company could offer EDF a set of expert advice to implement the analytical tests for the REACH registration. As a solution, EcoMundo collected the costs of the Letter of Access and then put together the member registration dossier. Results: All Inquiry dossiers were accepted by ECHA and EDF was given a registration number. Grouping the manufacturers in one consortium in order to share the costs. EcoMundo was asked to implement all the registration strategies as a member of a joint dossier or as a trustee of the consortium for the joint dossier. Solutions: EcoMundo managed the consortium which gathered several manufacturers from different countries for the REACH registration. Meanwhile, EcoMundo also managed to collect and validate the costs of the LoA in order to finalize the member dossier. Results: All dossiers were successfully registered and ThermoFisher was given a registration number within the deadlines. EcoMundo has been providing compliance services for ten years. With our Ph.D. experts, we bring all companies into compliance without putting pressure on your business. We understand you’re on a budget, which is why we have tailored our registration strategy to give you a great price! Our experts have chemical, toxicological, regulatory and even economic backgrounds. We never externalize: everything is done in-house! We offer a turnkey solution, but if you have a specific request, we also tailor to your needs. Benefit from total transparency in the management of the SIEF and technical activities related to the progress of your dossier. Discover our advanced software tool REACH Factory and ensure your REACH compliance. Read our articles on the REACH Regulation. Find out how we apply our skills to real-life situations!